What was the nature of Kipling’s Imperialism? 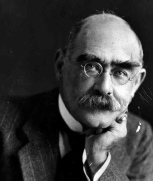 Kipling arrived back in Britain in October 1889 and found rooms in Villiers St just off the Strand. It was a central location near the London of theatres, smart hotels and clubs but also the centre of prostitution, music halls and crime. Without weeks of his arrival he was being feted by aristocrats, editors, writers and reviewers, as a result of the previous publication of the Indian Railway Library series with stories taken from the Pioneer. Close to where Kipling lived was Gatti's music hall and he often went there after a day's writing. He enjoyed the new world it offered and the new voices he heard. He began to see himself as the poet of this new world. In 1892 he published 'Barrack Room Ballads' many of which incorporated the voices he heard in Gatti's. There are stories about the soldiers of the Empire: Danny Deevor, Fuzzy Wuzzy and a poem that has received much negative criticism, The Ballad of East and West which has been taken to be about how east cannot meet west but it means the opposite. An English officer and an Afghan horse-thief Kamal discover friendship by respecting one another’s courage and chivalry. The ballad tells how, when Kamal the border thief steals a prize bay mare, the Colonel’s son (not named) follows them into enemy territory. When his own horse collapses from exhaustion the Colonel’s son, having lost a pistol to Kamal and being threatened with the prospect of making a meal for the jackals and crows, ‘lightly’ responds by promising vengeance. No lines of Kipling’s have been more freely quoted, and more often misquoted in exactly the opposite sense which Kipling gave them. The first couplet is an echo from the Psalms where the figure of speech is used to express the universality of the divine law in spite of estranging seas; the second couplet is Kipling’s commentary, with the same theme as the psalmist. Kipling had arrived home to find a country ill at ease with itself. It was a country that was beginning to question its position in the world as a result of losing its predominant position in the world and being challenged by emerging new countries like Germany and the USA as well as old rivals like France. The conditions of the armed forces, our isolation and how to strengthen the Empire were all being hotly debated. Britain was a country built on trade and trade dominated our economy to a far greater extent than our economic rivals. 75% of her cereals and 40% of her meat were imported, more than any other country. To pay for these imports she had to export and various parts of the country were wholly dependent on exports. Yet Britain had a negative balance of trade and had to make it up with a positive income from invisibles and investments. To protect these trade routes Britain had to have control of the seas otherwise a rival could starve us to death but in the 1880s the Royal Navy was in a highly unsatisfactory condition. Admiral Bacon had identified 1888 as marking the lowest level of efficiency that that the Royal Navy had known since the c18th and in the Pall Mall Gazette the journalist W T Stead questioned the strength and war readiness of the navy. The threat from abroad, the strength of the navy, free trade and the role of the Empire dominated political debates over the next 15 years. There was a particular group who advocated stronger Empire and this resulted in debates about fiscal union, the development of the new territories and whether we there should be a federal Empire linked by an Imperial Parliament. During the 1890s, debates about the Empire dominated politics in a way they had not done previously. The Empire was increasingly as providing the means by which Britain could maintain her dominance of the world at a time when that dominance was being challenged. During the 1890s Kipling continued to write on his usual themes: Duty and service, native life and the difficulties faced by soldiers and men of the Indian Civil Service. In 1891 he published 'Life's Handicap' and in it a sweet but tragic tale of crossing the cultural boundary in India , Without Benefit of Clergy. In this story John Holden leads a double life. To his colleagues in the civil service he is a bachelor, living in spartan bachelor quarters, and sometimes neglecting his work. But he has set up a young Muslim girl, Ameera, in a little house on the edge of the old city. She is the love of his life, and he of hers. They are idyllically happy together, and when she gives birth to a baby boy, Tota, their happiness is complete. When Tota dies of fever, they are distraught. Then Ameera is stricken with cholera and dies in Holden's arms. He is left desolate, and the house is soon pulled down. The idyll is over as if it had never been. As well as continuing to write about his experiences in India, Kipling was writing about what he saw as a lack of interest in England in the Empire. The English Flag published in 1891 is the first of his Imperial warnings to the British people. From this time on he becomes more and more involved with political issues and becomes more and more a preacher or a prophet as he was called. Some would say that he more he involved himself in politics the less creative he was. In 1892 Kipling married to Carrie and they went to the USA to live. The same year he began on his greatest work, Kim and in 1893 he wrote The Bridge Builders which is about the familiar theme of duty but also makes the point that the native, Peroo, who is the most capable of the characters in the story will soon be able to build a bridge of his own. Is this Kipling saying that the Indian people will soon be able to take more responsibility for their own development? The bridge, thought be based on the Sutlej Bridge in the Punjab, is nearing completion when it is threatened by a major flood. After taking all possible precautions to save his bridge, the Chief Engineer, Findlayson, is swept down the river at night in a small boat, onto an island, with his Lascar foreman Peroo, who gives him opium to stave off the cold. Under the influence of the drug, he has a vision of the gods of India. They do not care for change in the old order of things, and so protest against the bridging of the river. The bridge stands, despite the flood, but in the broad sweep of human history, perhaps this is not such a deep loss to the old gods, who will always be there to claim the allegiance of men and women in different ways, whatever material changes there may be. While people dream, the gods will still be there. In 1896 The Seven Seas was published, a collection of poetry which shows how his views on empire were evolving. The theme underlying much of the collection, is that the English are the Chosen People under the Lord, so long as they obey the Law. This theme is stated on the very first page in The Song of the English. This is one of Kipling’s earliest verses specifically setting out his vision of the British Empire which now centred on the white settler colonies and the common heritage of the English speaking peoples. Kipling was now writing about an Empire in which Britain stood at the centre binding all parts in a bond of common motherhood. In 1896 Kipling and his family returned to Britain and it was while the family were living in Torquay that Carrie and Kipling met two men who were strong advocates of a stronger Imperial policy and who were to become firm friends over the years: Alfred Milner and Cecil Rhodes. Milner considered himself a race patriot whilst Rhodes had said, "I contend we are the first race in the world and that the more of the world we inhabit the better it is for the human race". 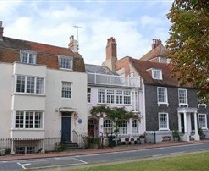 By the summer of 1897 the family were living at North End House, Rottingdean and were living there at the time of Victoria's Jubilee in June when London was full of pomp, and swagger as 50,000 troops from all over the Empire took part in what became a celebration of Empire. 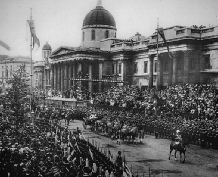 The main events were a naval review at Spithead and a procession in London. Kipling himself did not attend the day of the Jubilee Procession but he did attend the naval review soon after of 165 ships. He was so taken by the scene that he decided to write Recessional almost as an afterword. Before this he had had no intention of writing a Jubilee poem. The poem Kipling found himself moved to write was at odds with the popular mood: the poem not only cautions against over confidence and popular patriotism, it reminds the nation of its duty to the Empire and how far flung it is. He was now not just the Imperial Laureate but the Imperial Prophet, indeed Rider Haggard referred to Kipling as 'the watchman of the Empire'. At the time he was writing Recessional, Kipling had begun to write another poem that would be about Empire and duty and which would cause and still does cause huge controversy for its extreme racist language. The poem White Man's Burden' was published in the USA in February 1899 and came out the very day that an uprising broke out in the recently acquired Philippines territory. Kipling was returning to his central Imperial theme of duty, but this time telling the Americans what their duty was. Although the choice of words is tactless, white clearly refers to civilisation and character and not the colour of skin. The 'White Men' are those who conduct themselves within the law for the good of others. Even so, the poem is profoundly racist in content- the Filipinos and by implication many other non-European natives in the world are wilder, sullen, slothful and heathen. The message Kipling is giving the Americans is the same as he gave for British rule in India: after rulers have taken possession it is their duty to take care of the sick and dedicate their lives and even die for the sake of native peoples. The message is paternalistic and idealistic. The language is harsh. In writing White Man's Burden, Kipling was fully supported by the establishment and the British public. The British believed that as a result of their industrial and technological supremacy throughout the c19th, they were the chosen race and Kipling reflects this in this poem which is reminding the USA of what is the duty of an Imperial power. Was he a racist? The society of which he was a part was considered racist in its language and attitudes by us today but should he be judged by later generations? Society then had a different concept of race and indeed ideas on race were vague and inconclusive. These were times when there were constant debates about the nature of race, following the publication of Darwin's 'Descent of Man' in 1871 and Kipling's views concord with the prevailing views of the time. His views on Empire though remained constant and when the nation seemed to fall out of love with Empire, he remained committed to what became outmoded ideas. Kipling is often branded a 'racist' and a' jingoist' or an 'imperialist' and this popular view has made him unfashionable. Kipling though was essentially a paternalist, a man of his times who reflected the accepted attitudes towards empire and race. He was a great lover of the Indian people and believed that the Raj was there to benefit the people. He believed in the British Empire, becoming its unofficial spokesperson, but was not able to come to terms with the increased criticism of Empire after the Boer War.